It’s Friday, and that means it’s the start of the weekend! 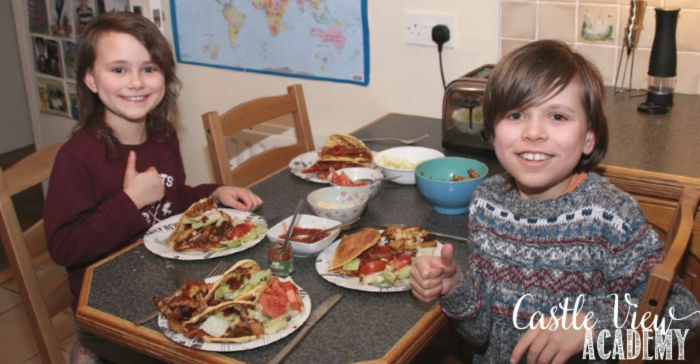 But Fridays are very busy for us as the kids have to leave for their Ju-Jitsu within an hour of Phil arriving home from work, so we need a dinner that is fast and will also provide the children with the energy they need for training. 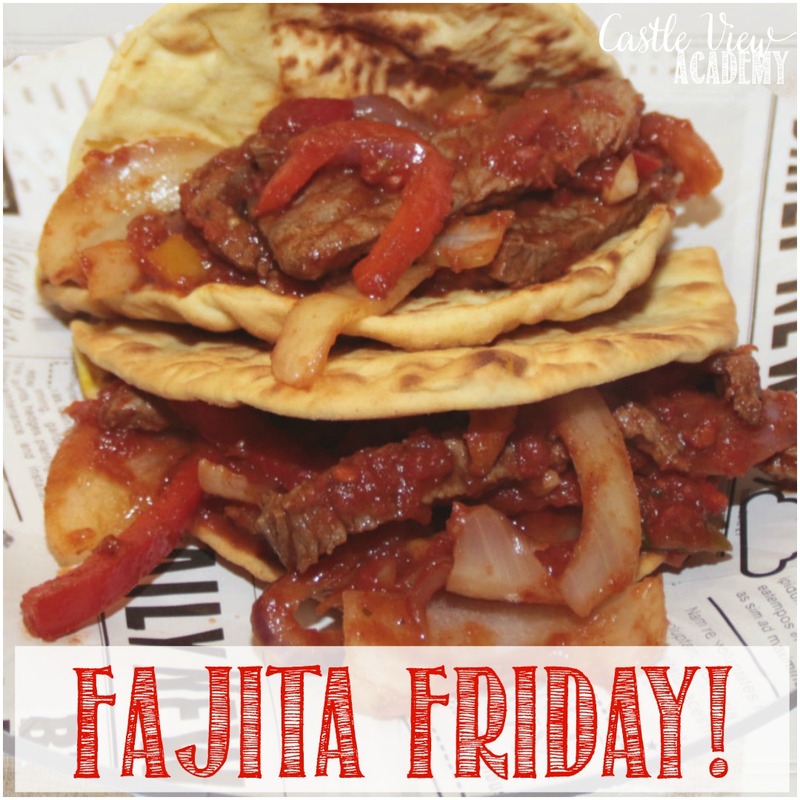 Our favourite dinner is beef fajitas on Friday! 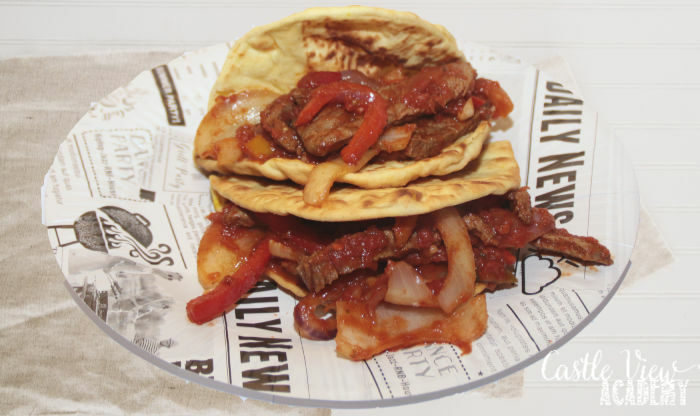 This post in an entry for the #MeatMatters Challenge, sponsored by Simply Beef and Lamb. Learn more about the benefits of cooking and eating beef and lamb along with recipe ideas and inspiration here. I know that for me, by the time the end of the week rolls around, I’m worn out and looking forward to a little relaxation, even if it’s just watching a movie with Phil or reading a book before bed. After a week of homeschooling and taking care of all the meals, I need a break. But I’m still a mom who wants my family to eat well, regardless of the day. This is where it’s fun to be creative. It’s nice to be able to serve something for dinner that feels like a treat, but is so much better in both taste and nutrition than than a takeaway or frozen meal. Our fajita Fridays were born one day when I saw a tray of good-looking beef on sale at our local shop, which I couldn’t resist. I took it home, not yet knowing what I would do with it. I put it in the fridge and forgot about it. Before I knew it, the day had passed and Phil was on his way home and the kids would soon be heading out the door. I opened the fridge, had a look inside, and there wasn’t much there as it was just before our big shop. I saw the beef, an onion, and some potatoes. Hmm. I had a peek in the freezer and saw some frozen peppers and a packet of folded flatbread. Yes! I could make a fine meal from these few items, with a little help from the spice cupboard, too. Beef is a good source of iron, protein, and 8 essential vitamins and mineral that support good health and well-being, which makes it perfect for the end of the week and to keep the children strong for Ju-Jitsu, too. This list looks long, but keep in mind that you’re not using any mixes with artificial preservatives and flavour enhancers; you know exactly what’s going into this meal and can adjust according to any family needs and preferences. And as an added bonus, you will save a lot of money by mixing your own spices instead of purchasing packaged ones! This recipe is super easy, but shhh, don’t tell anyone your secret! Chop all the veggies ahead of time so that they’re ready. Have your children help with the onion and peppers, as it’s great for those fine motor skills, life skills, and feeling involved. If you’re really pressed for time, you can use pre-cut frozen onions and peppers. Place the beef in a skillet and start to brown it, then add the onion and let them sweat. Remove the beef and slice it across the grain into strips and add it back to the pan along with the tomatoes, peppers, and the spices. Stir and let all the flavours mingle and party while simmering. READ The Stately Home; How Do You Spend Your Days Out? Have the kids set the table in anticipation as it won’t be long now! 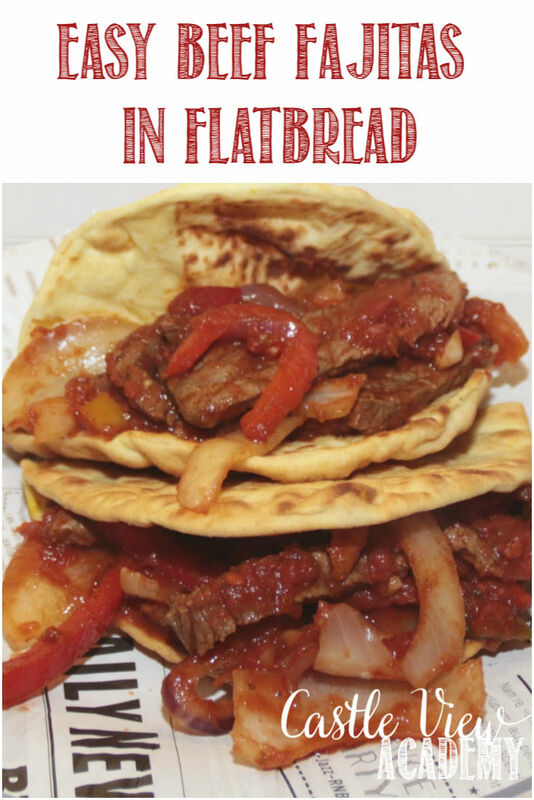 When everything is heated through and cooked, fill the flatbread with the beef fajita filling and serve your hungry crew! 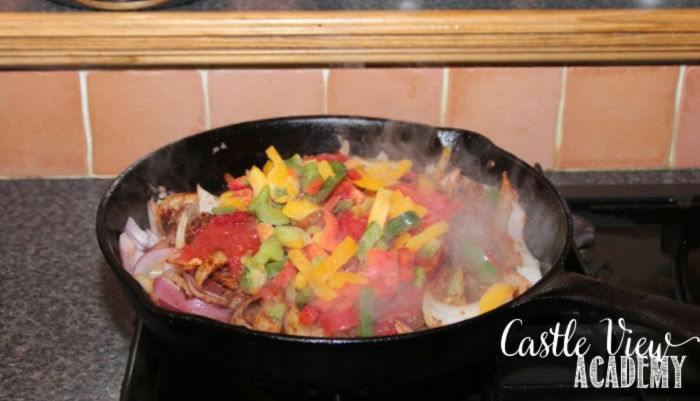 We like to set out optional toppings onto the table so everyone can add what they like to their own fajita to personalise them. We also like to serve our beef fajitas with homemade spicy fries topped with salsa, and a side salad or grilled veggies. Now it’s time to sit down together, enjoy the meal, and chat about the day while bonding over great food. 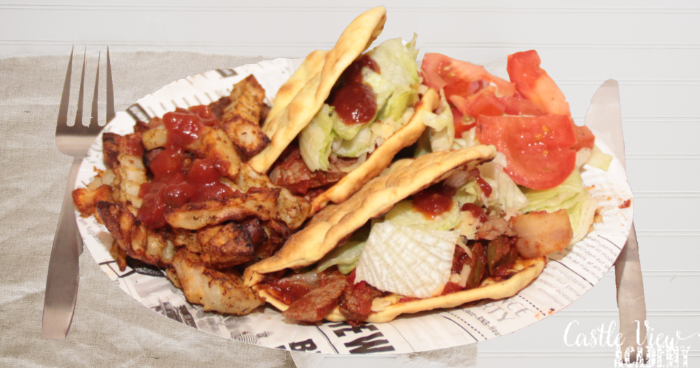 Be sure to have napkins ready, as this meal can be a little messy (so I won’t share a picture of the meal in progress), but that just adds to the fun! 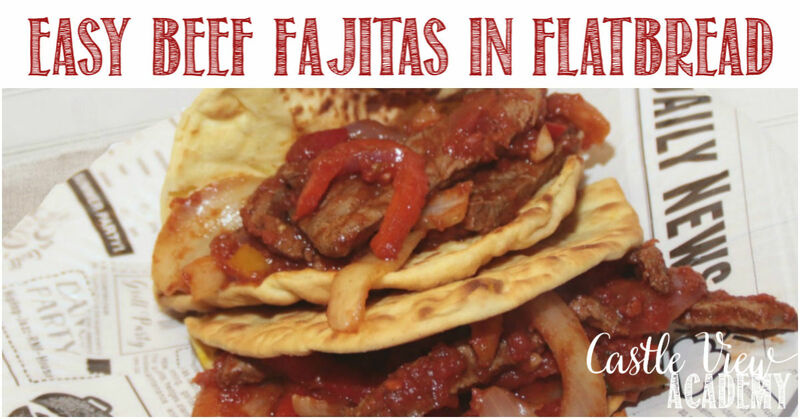 How cool would you be to make beef fajitas for a kids’ party or family get together?! 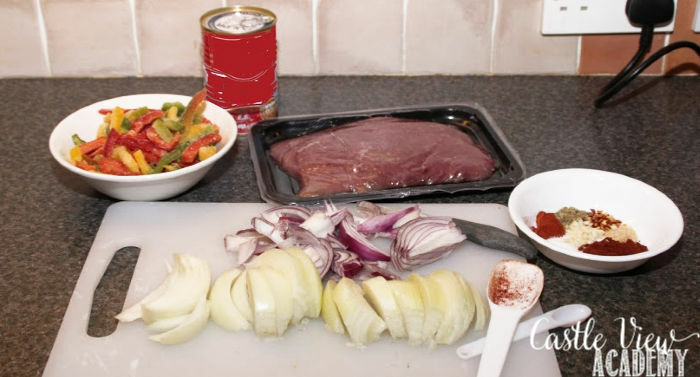 Do the chopping ahead of time and have everything set up on a side table for a fajita bar. It would be easy to make on a barbecue for a picnic or camping, too. And if you want to be ahead of the game, cut everything up and throw it in a freezer bag ready to pull out and toss into the skillet at a moment’s notice for a stress-free fun Friday meal when you don’t know what to make and time is short. You could even purchase a bag of pre-shredded cheese and put that in the freezer, too, and just bring out what you need at the time. I just love meals that take little prep, are healthy, and make my family happy. Score one for this mom!